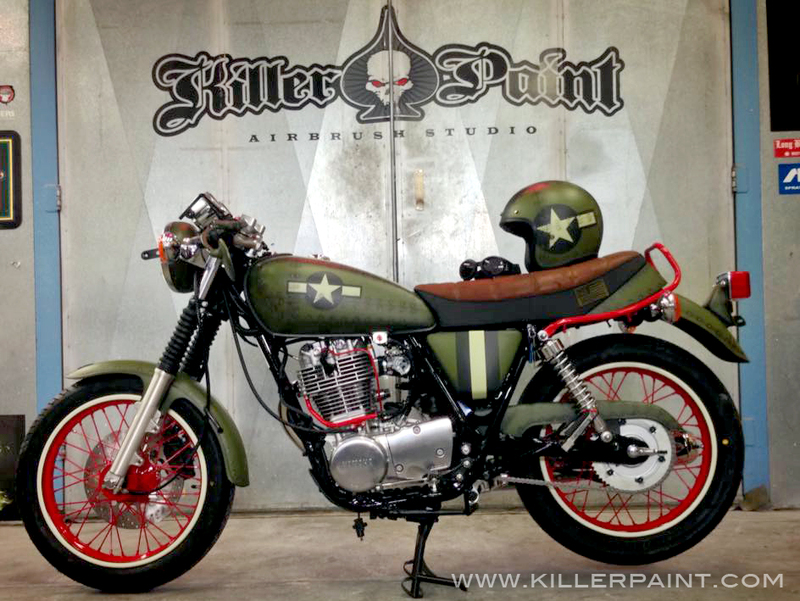 This Yamaha motorcycle came to Killer Paint from an agency working with Progressive Insurance on a show display piece. 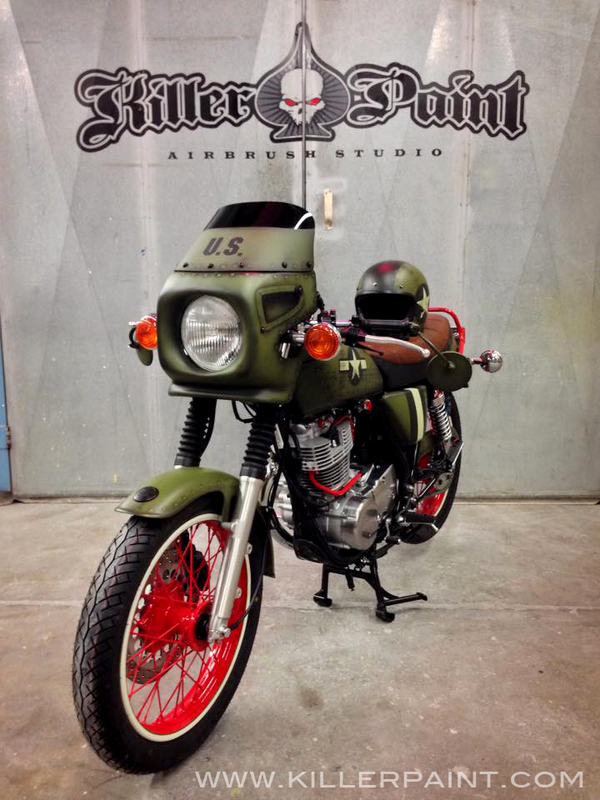 This design of this bike has a bit of a retro-throwback feel, which made it a great choice to do a vintage military aircraft homage theme. This motorcycle was in great condition, so very little in the way of prep work was needed, and work could start right away. 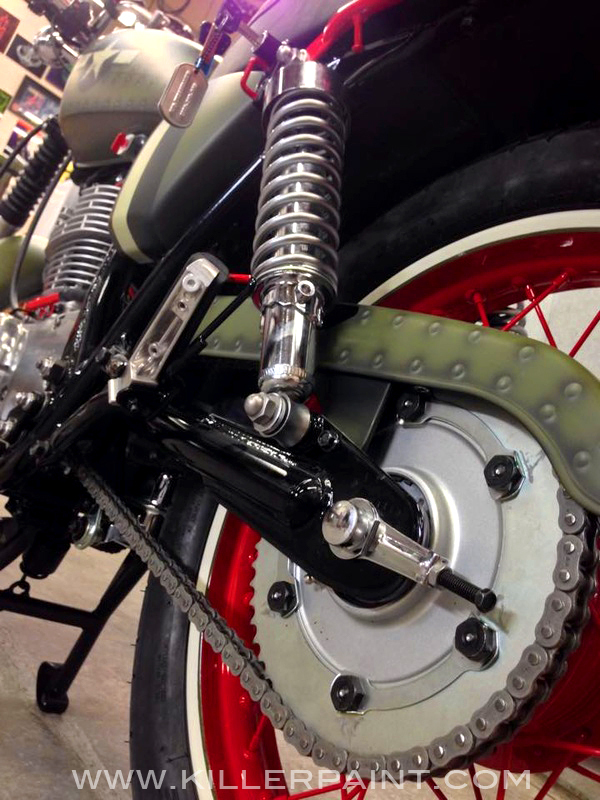 The intention for this bike was to keep it simple and elegant, so the color palette is pretty basic. Green, white and black, with splashes of red for a little bit of extra eye-catching pop. 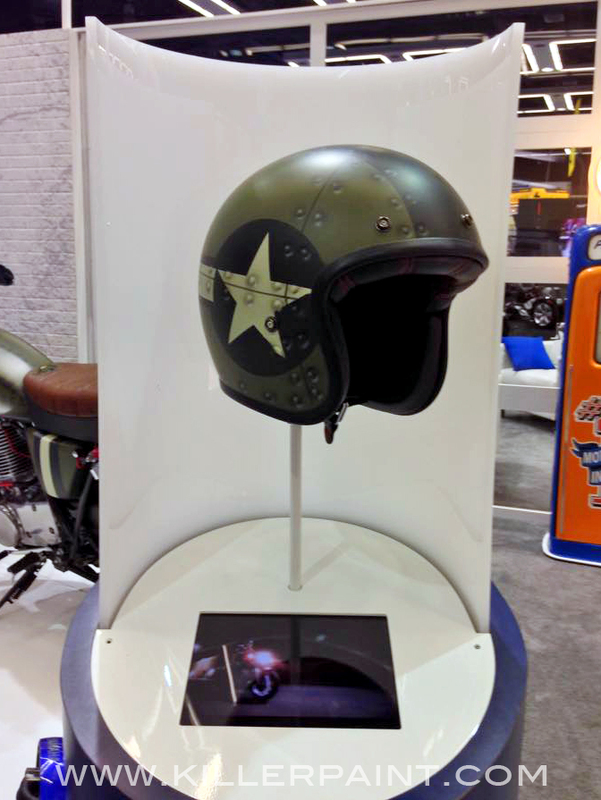 The helmet that accompanied the motorcycle was also painted to match. While some of the parts were being prepped for paint, others were sent out to be powder coated. 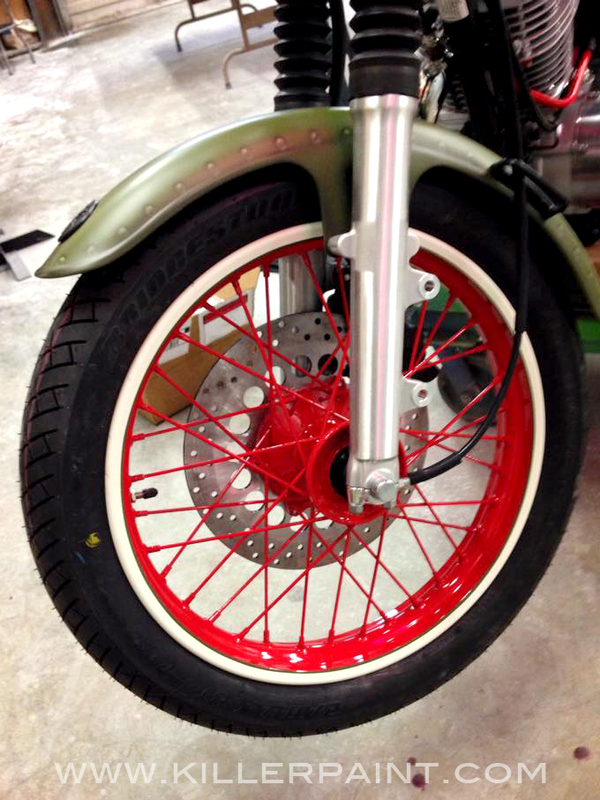 The wheels, rear grab bar, some of the hard lines, and a few other pieces were coated in bright red. The frame stayed black. The seat was also removed and sent out to be re-upholstered brown, to be more in fitting with the vintage feel that was the aim of the project. 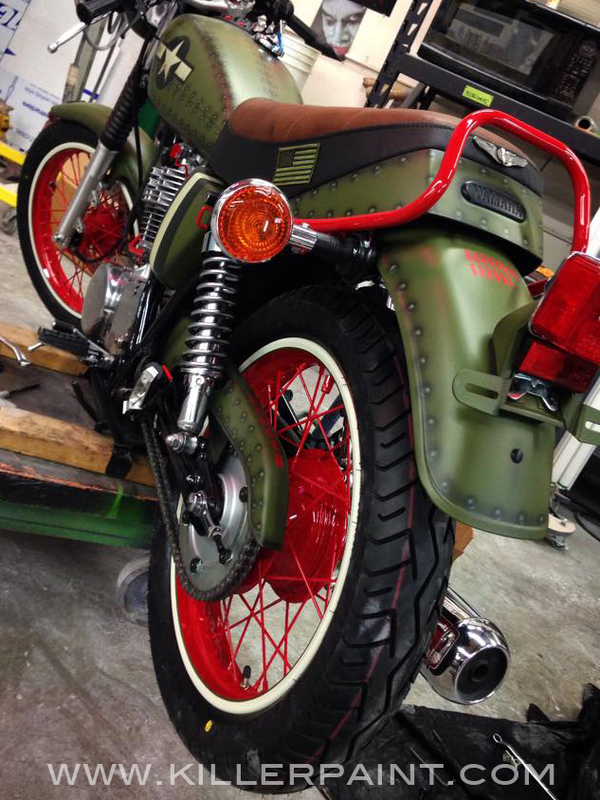 Some green military patches were sewn on the sides and top of the seat too. After the emblems were painted on, many of the green parts (and the helmet) were given faux rivets and simulated panel lines. 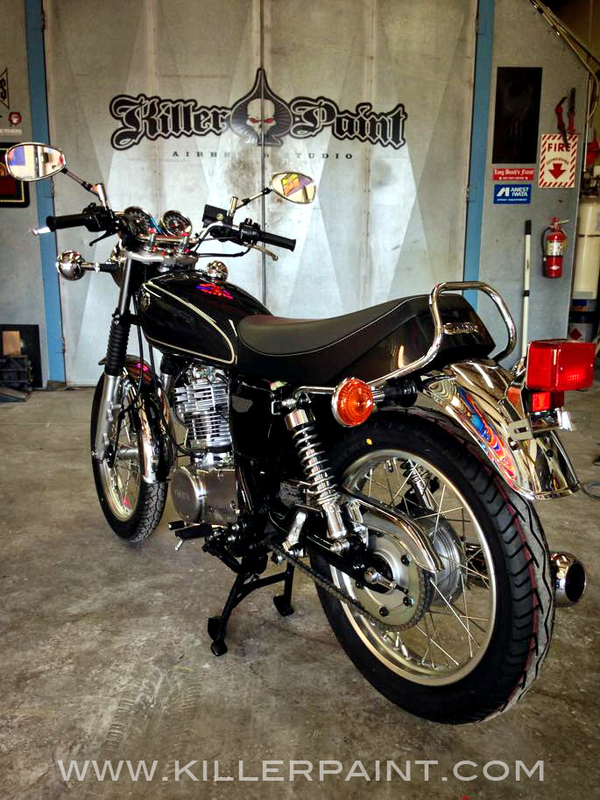 Mike also decided to invert the rearview mirrors for a retro motorcycle racing feel. 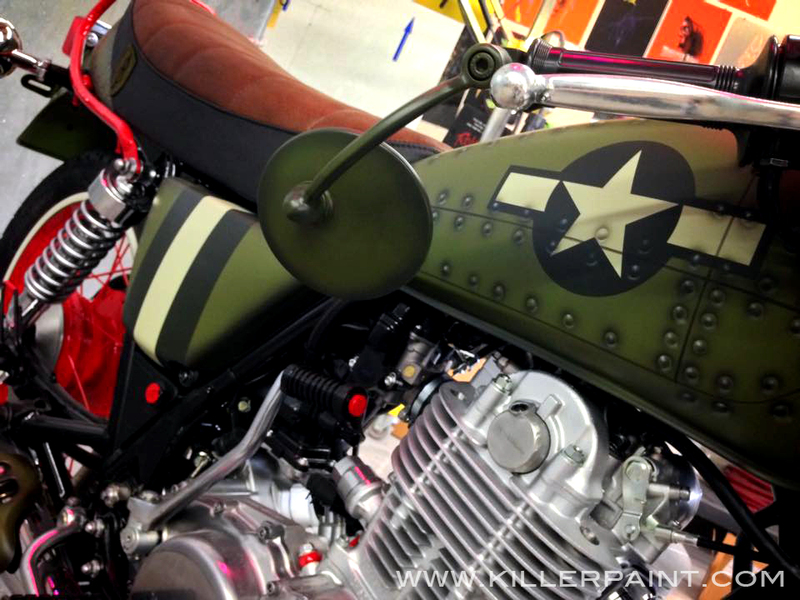 All of the paint was finished in a matte clearcoat, to make the whole bike seem more like a military vehicle than a glossy finish does. A little something extra was finally delivered while the rest of the bike was in progress- the additional fairing that Mike had ordered just for the project. It got the paint, rivets and emblems treatment as well. Part of the windscreen was painted green too, in order to give it the appearance of having a little more substance. A pair of faux intake vents were painted on each side, too. Once it was attached, it greatly changed the look of the whole project. 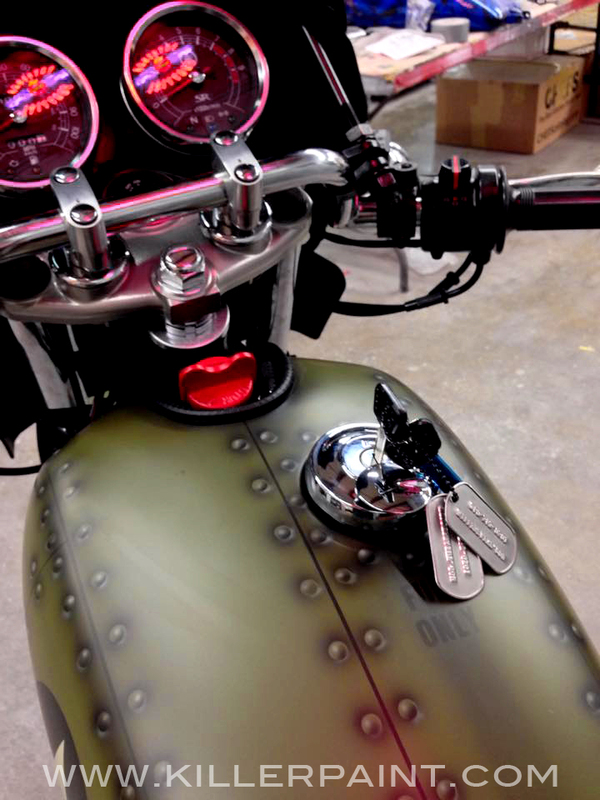 As a final extra touch, Mike went to a local Army Surplus store that had an authentic vintage dogtag stamping machine, and had a pair of Killer Paint dogtags made to serve as the keychain for the bike. 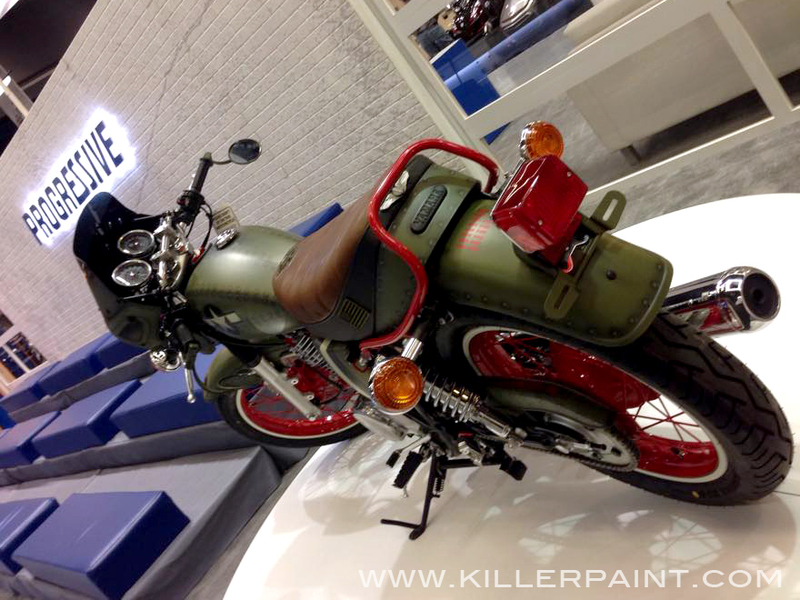 We received a few photos later of the motorcycle set up in the display at a show. The bike and helmet each got their own spaces. The project was completed relatively painlessly, without much in the way of unexpected problems or delays, and the customer was thrilled with the result. The customer gave us pretty much full reign on the design, which was fantastic. When a customer dictates too many specifics on a job, or micro-manages the work being done on a project, it does more to bind one’s hands creatively. Artists usually do their best work when creativity isn’t stifled or restricted by a laundry list of requirements or details. Otherwise, they can’t do anything beyond the scope of what they are told, and the job can be no better than such a list asks. In this case, allowing creative license made the whole project turn out that much better. 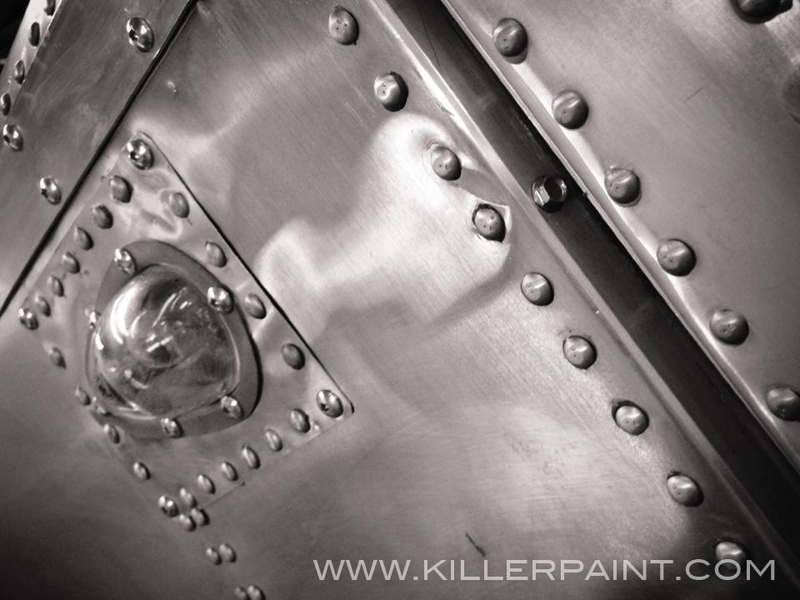 Before we take a look at this project, we at Killer Paint would like to ask a moment to focus on the rash of destructive wildfires taking a heavy toll on the western United States this summer. Whole towns have been forced to evacuate, and many people have lost their homes and livelihoods as houses and businesses have been laid to waste in the wake of these fires. It is equally important, if not more so, that we take the time to recognize the men and women who dedicate themselves to fighting these fires, giving their every effort to protect lives, property and the environment. We offer our thanks to the firefighters doing their best against sometimes terrible odds in trying to oppose these primal forces of destruction. Recently, in our own proverbial backyard, three firefighters working for the U.S. Forest Service lost their lives fighting the wildfires near Twisp, Washington, on Wednesday, August 19. 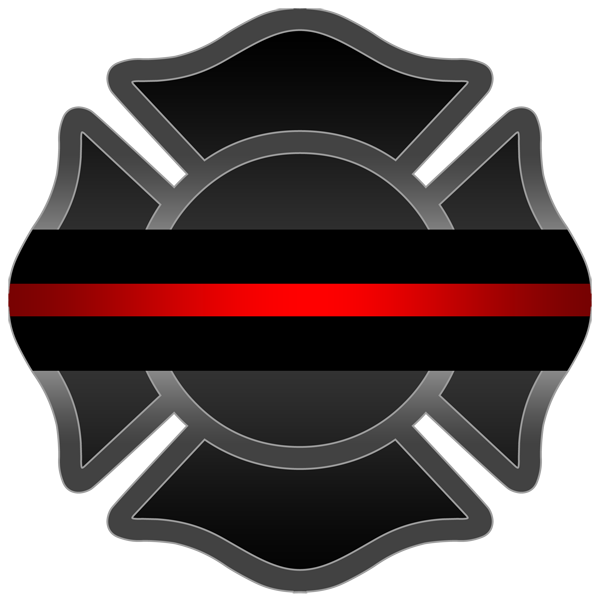 We offer our sympathies to the families, friends, and colleagues of those who gave their lives protecting others here and elsewhere. 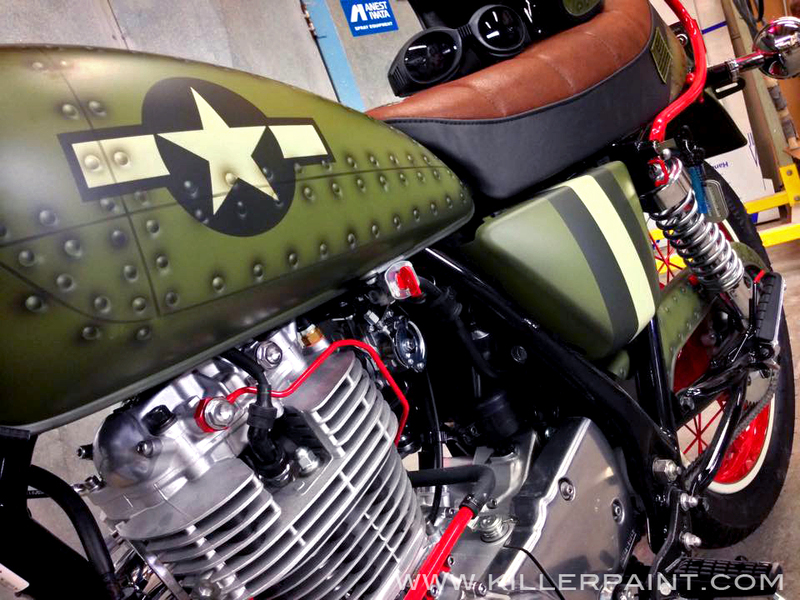 Some time ago, a customer came to Killer Paint, requesting a special custom refrigerator, based on a World War II bomber. 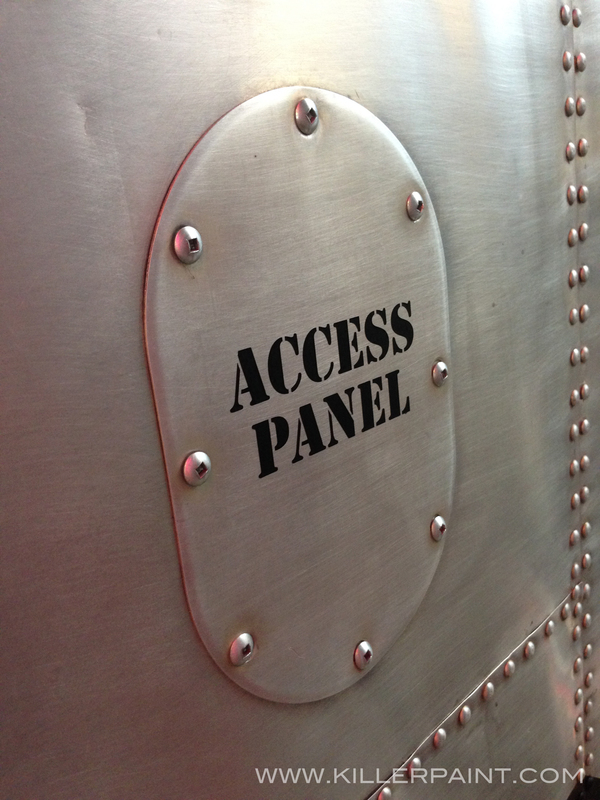 The owner of this refrigerator, Troy W. was the pilot of a converted B-17 that had been put to use in aerial firefighting. 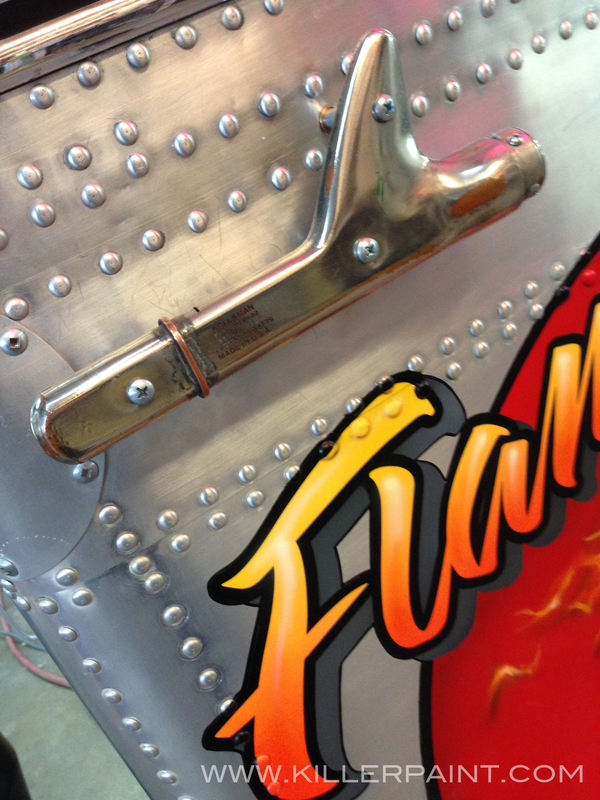 The aircraft, dubbed the Flame Dame was the model and inspiration for this project. 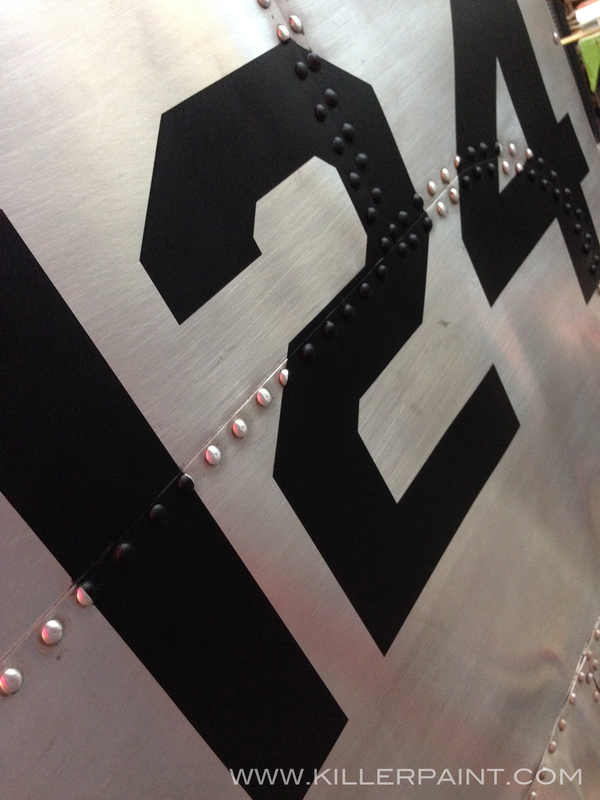 So to match to appearance of this plane, hundreds of the rivets were attached one by one to form panel lines similar to the original World War II bomber. The aluminum was lightly scuffed and weathered to give it a distressed, worn look, and the rivets were lightly stained to make them look aged and a little gritty. While the refrigerator was brand new, it wasn’t supposed to look that way. Small metal pipes were bent into shape and attached to the side of the fridge to simulate fluid lines, along with many other details that were also added. 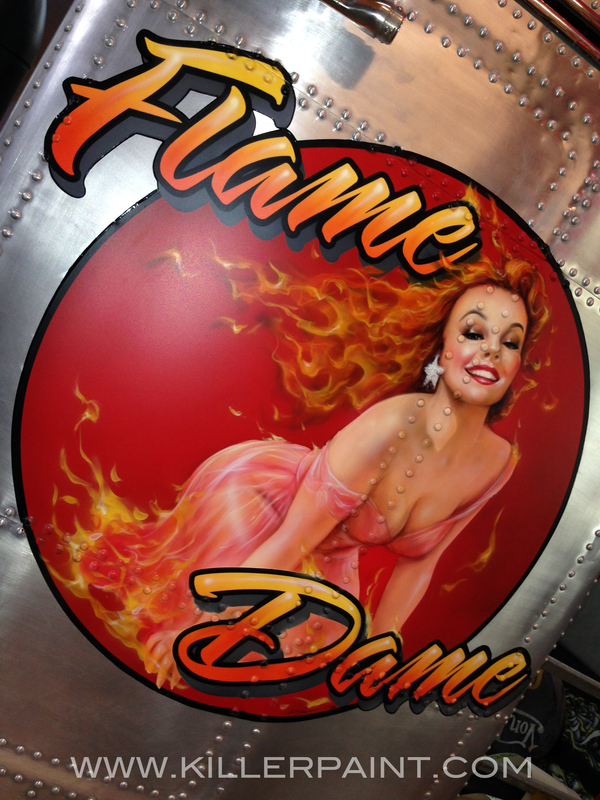 The “Flame Dame” pin-up art on the original aircraft was a very basic art style. Mike wanted to put something more artistically robust on the door, though. He chose a classic pin-up, a homage to the great Gil Elvgrin, to turn into the new Flame Dame, with a fiery dress and mane of hair. 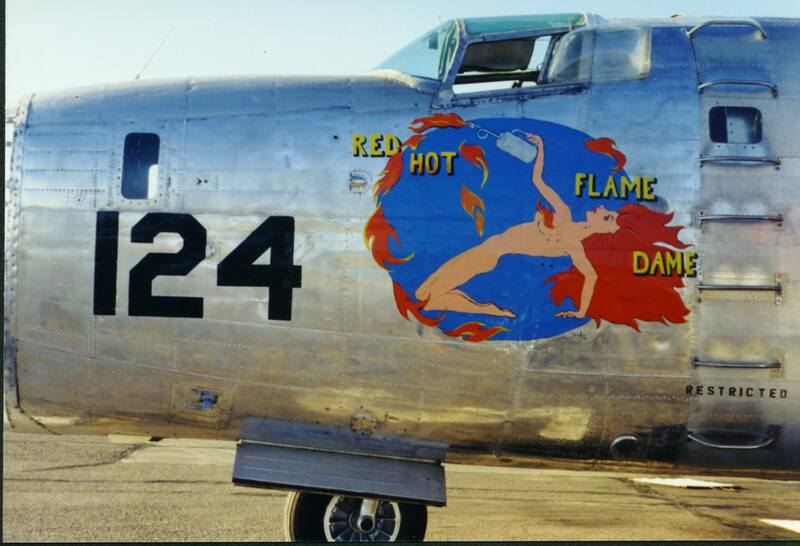 Some more added details include a large “124,” which was painted on one side to match the number on the original Flame Dame bomber, while some smaller aluminum pieces made to look like access panels were added, too. Here is a video showcasing the project. The door is wired to set off the digital player built into the refrigerator and play several different aircraft sounds. 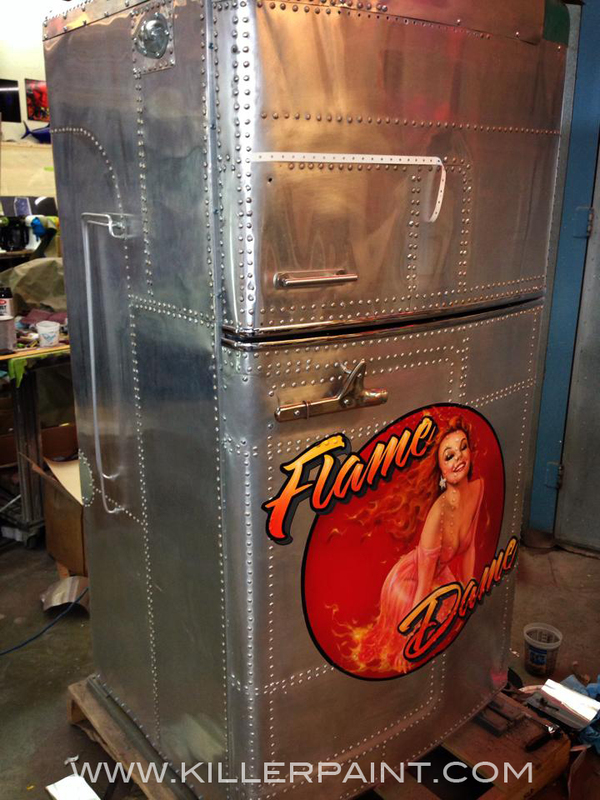 Mike also wanted to incorporate some authentic aircraft parts into this refrigerator. 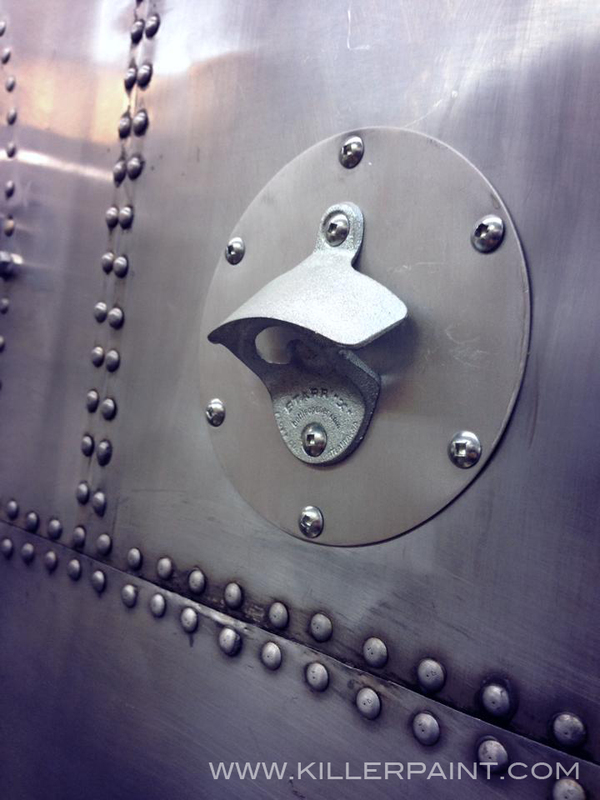 For instance, the door handle is made using an air speed indicator pitot tube. The Grimes wingtip lights that are mounted on the upper sides are actually wired up to light up and flash in conjunction with the sound triggers when the door opens. With all the hardware going on the outside of this thing, Mike decided to add something fun and convenient to the mix as well. 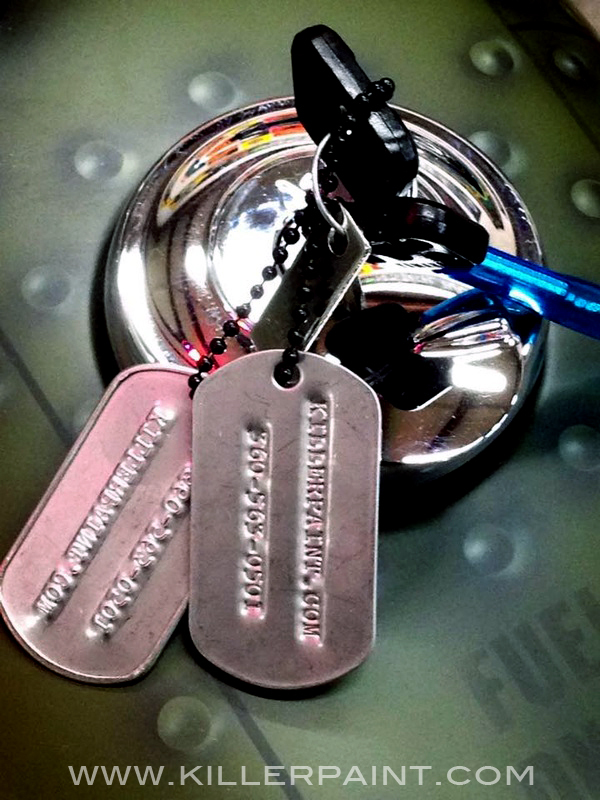 So he went and got a mountable metal bottle opener and secured it to the side of the fridge on a round baseplate. It may not be something you find on the outside of any aircraft, but it is definitely something that works well on the outside of a refrigerator. At least now nobody will have to go anywhere to open their cold ones. 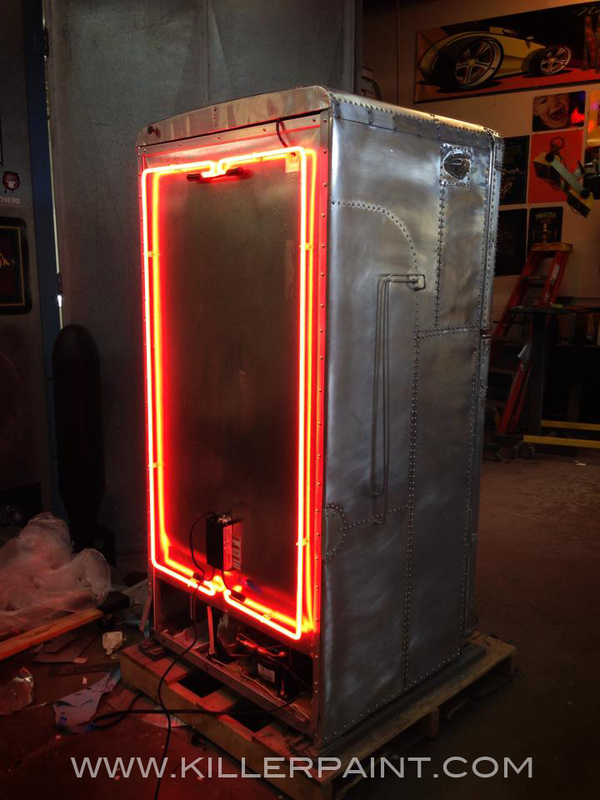 The final touch that Mike likes to put on many of the custom fridges that come out of Killer Paint is to light the back with neon. Sure, LED lights and such are cheaper and easier to work with, and there is a multitude of color choices available, and so on. The problem with that route is that they just don’t light up with quite the same full-bodied glow as good old-fashioned neon. When this baby is placed in its final location, the light really turns the whole thing up a notch, especially in “man-caves” and home theaters, which is the place most people have in mind to put one, when they come to Killer Paint looking to get a custom refrigerator of their own. Just because this refrigerator was complete didn’t mean that the work was done. You can’t just throw this one in a cardboard box with some foam peanuts, especially with fragile glass neon tubes on the back. 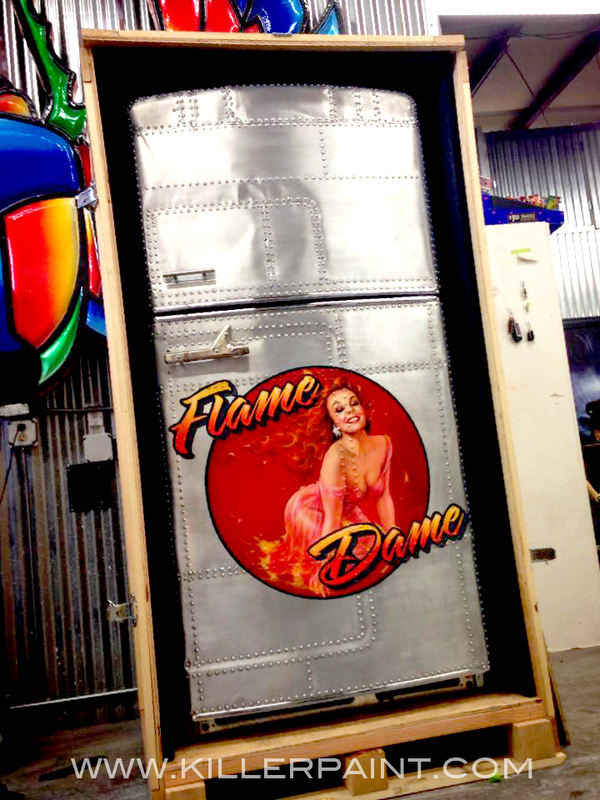 After having a sturdy shipping crate built with foam padded lining, the Flame Dame fridge got packed up all safe and snug, and was ready to ship off to its new home. 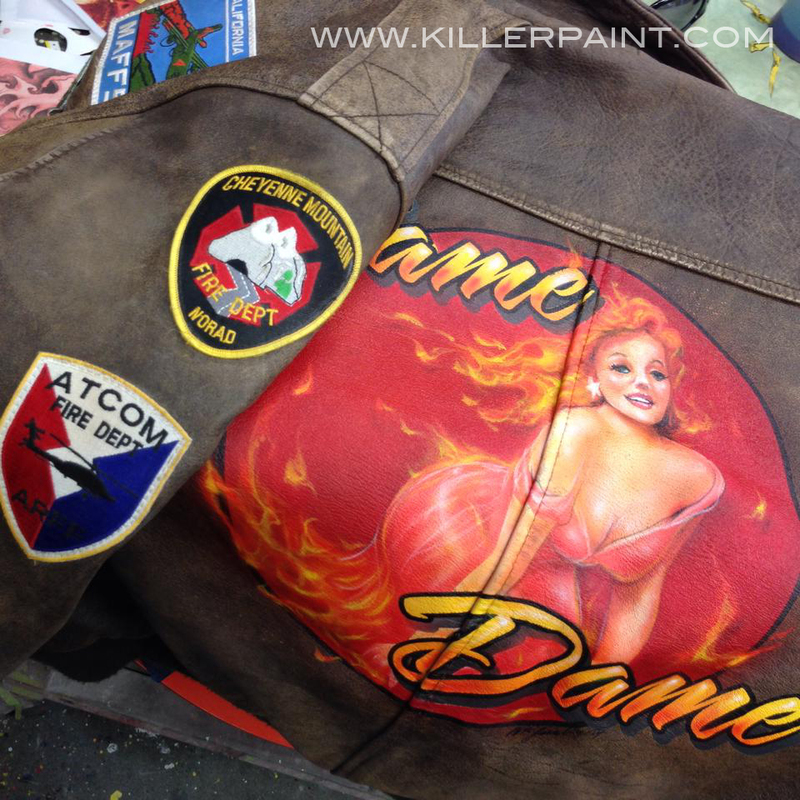 To accompany the project, Mike also painted the back of a bomber jacket with a second Flame Dame pinup to match the one on the door of the fridge. 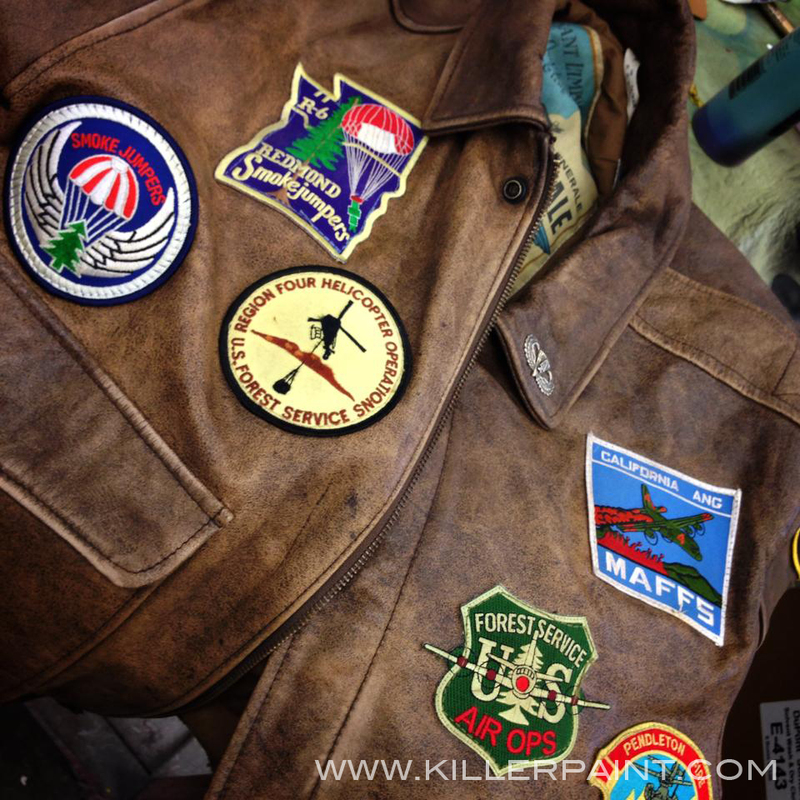 A local seamstress sewed the patches from different firefighting organizations on the front and sleeves of the jacket as well.